Everything you need to know about setting up ScreenCloud with an Intel Compute Stick using Windows. If you’re a fan of Windows, it’s likely you’ll sway towards it when it comes to setting up and running your digital signage displays. A Windows device or a media player that runs Windows, such as the Intel Compute Stick, is just as good a route through which to set up your digital signage displays as other common devices such as the Amazon Fire TV Stick. The beauty of the Intel Compute Stick is that it has the full power of an Intel processor in a teeny, tiny format. The Intel Compute Stick plugs in via HDMI (a port that pretty much every screen has these days) and can run ScreenCloud through our Chrome App on either Windows or Linux. This is great for displaying images, video files, social media and more. In this guide, we’ll walk you through how to set up ScreenCloud Signage using a Windows device plus a step-by-step guide to using the Intel Compute Stick on Windows. Ensuring that you can begin showing rich digital content in mere minutes! Oh and if you’re struggling to decide what media player you need in the first place, check out our hardware selector tool - it’s guaranteed to help. On your Windows machine of choice open Google Chrome (or any browser) and head to https://release.screen.cloud/. From here, you can download the ScreenCloud player for Windows. Once you’ve downloaded the ScreenCloud Windows app, the ScreenCloud player will start up. 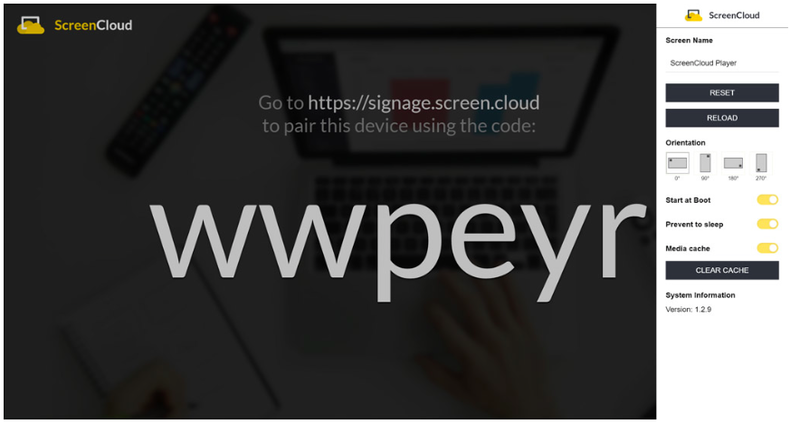 You’ll see a pairing code, similar to the below on screen. Make a note of this - you’ll need it in a second. 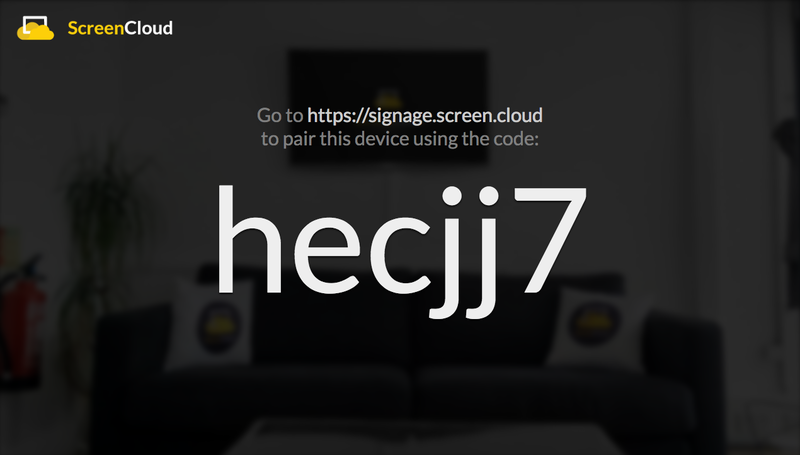 Once you have your pairing code, visit https://screen.cloud on your laptop or PC. If you haven’t already, set up a free trial by selecting “try it now” or login to your account using the Login button. Once logged in, you’ll see a screen which looks like the below. Select “Add Screen” type in your pairing code from step two and that’s it - your screen and your Windows device are paired, ready for you to control content from wherever you are. If you’re looking to get started with an Intel Compute Stick plugged into your TV screen to make it “smart”, one of the easiest ways to set up the device is through Windows OS. There are many other factory-installed operating systems, but in our experience, Windows is the way to go! 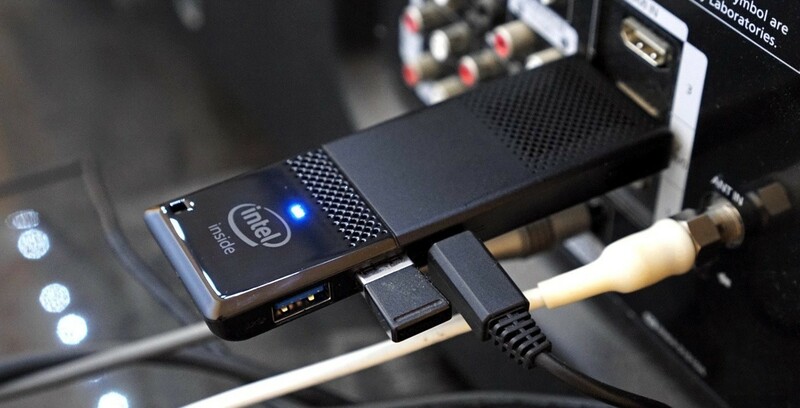 The Intel Compute Stick can be plugged directly into your HDMI port, or you can use the mini USB adaptor which usually comes with it, to help secure it to your screen. It’s also best to plug in the power adaptor, connected to the mains at all times. The start up of the Intel Compute Stick looks similar to starting up a computer with Windows desktop - so it should be familiar if you’re a Windows user! Once your Intel Compute Stick is running, connect your TV to WiFi or a network using the same method you would use to connect a PC to WiFi. Once you’re connected, open Chrome or any other browser and download the Windows app from https://release.screen.cloud/. Once the app has downloaded, open the downloaded file which looks something like ScreenCloudPlayer.setup(version number).exe. Note - if you’ve followed the steps in part one you’ll notice that these next steps are exactly the same. So feel free to skip ahead if you need to! Select “Add Screen” type in your pairing code from step two and that’s it - your screen and your TV running the Intel Compute Stick are paired, ready for you to control content from wherever you are! Your Intel Compute Stick will begin to play ScreenCloud automatically each time your TV restarts. If you need to access the settings you can do this by opening the ScreenCloud settings menu, as shown below. Digital signage and the Intel Compute Stick = simple! ScreenCloud Signage is perhaps the easiest way to get your Intel Compute Stick up and running using digital signage software. What’s more, is that ScreenCloud also offers a super easy CMS that allows you to begin showing rich images, videos, social media feeds, apps, presentations and more to your digital screens. If you’re ready to get started head to https://screen.cloud today.